The Vietnamese economy faced further uncertainty due to the impacts of global shocks, according to the Viet Nam Institute for Economic and Policy Research (VEPR). 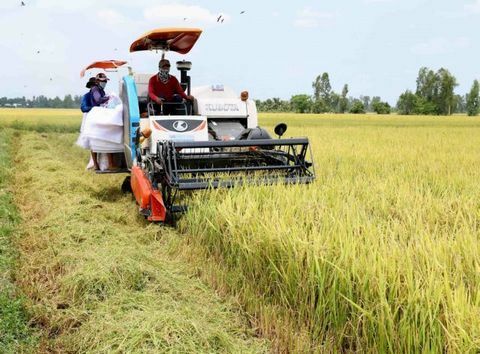 Rice harvested at a field in An Giang Province. The global shocks might influence the Vietnamese economy. VEPR director Nguyen Duc Thanh was speaking at a conference Thursday in Ha Noi to announce the institute’s report about Viet Nam's macroeconomic situation in the first quarter of this year. Thanh pointed out the global developments that could influence the Vietnamese economy, including the US – China trade war, protectionism, risks from the Chinese economy, Brexit uncertainty and internal conflicts within the European Union. In the first quarter, Viet Nam’s economy grew 6.79 per cent, lower than the 7.45 per cent recorded in the same period in 2018. VEPR’s report pointed out that economic growth was still largely dependent on foreign direct investment (FDI) sector and its exports. Privatisation of State-owned enterprises had seen little progress. The number of suspended enterprises in January was unusually high at 23,082 firms - the highest number recorded in the last ten years. These figures demonstrated that Vietnamese firms remained weak and the business climate needed to be improved, according to the VEPR. The VEPR predicted growth would slow in the second quarter to 6.32 per cent, then reach 6.94 per cent and 7.16 per cent in the last quarters of this year to hit the Government’s target of 6.6-6.8 per cent. Recent electricity and petrol prices hikes were creating pressure, the VEPR said, urging caution from the State Bank of Viet Nam in order to reach its inflation target of 4 per cent for the full year. Inflation was at 2.63 per cent in the first quarter. Still, the VEPR predicted inflation at 4.2 per cent for the full year. Priority should be given to ensuring flexible foreign exchange policies to ease the impacts from external shocks, and interest rates should be kept stable to create favourable conditions for businesses. In addition, VEPR’s report pointed out the US-China trade war had created opportunities for Viet Nam's economy. When the production supply chain shifted from China to neighbouring countries, Viet Nam needed to improve the institutional, business and labour quality environments to grasp opportunities. However, the challenge for Viet Nam was moving forward when the country’s infrastructure was not yet ready to receive waves of production shift. VEPR also urged incentive policies for FDI firms to be reviewed to create a more level business environment for domestic firms.